For those who sent me emails, smses, blog comments and FB comments, I am well and okay. Many thanks for your concern. Life will be back to a routine after this weekend. Besides the funeral, this school holiday was good. At the beginning of the week, hubby took half a day off to take us to the Garden by the Bay. Actually we were there on Sunday but the queue to purchase tickets to the two domes, were terribly long so we just walked round the garden and had our dinner there. I wish the signs of different areas are clearer though, and more write up on each location or plants. Guess there is still room for improvement. When we were back again on Tuesday, we visited the two domes, it was not so crowded and we enjoyed ourselves tremendously. Being air conditioned helps a lot. I particularly love the flower dome. How I wish it was my garden. So school reopening on Monday, I have to get more snacks ready for the kids. Though I love Oreo but seeing how my son whacked those cookies really scares me. Just imagine the amount of sugar intake he pumped into his body on a daily basis. I decided to bake some healthier choices for him. In fact, I actually baked a batch of chocolate chip cookies to munch while we were at the wake but my son nearly ate the whole jar of cookies by himself. Pretty scary, isn’t it? I will baked another batch soon as I have gotten really good reviews for it. 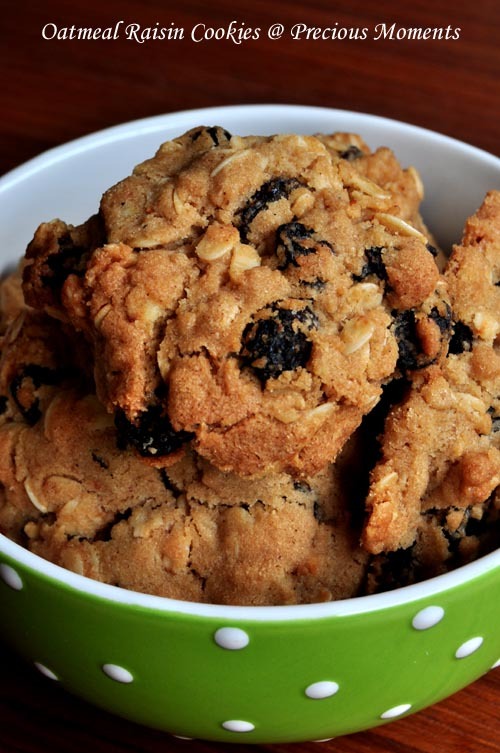 In the meantime, here is a much healthier choice, Oatmeal Raisin Cookies to munch on. With my last successful attempt on Snowskin Champagne Truffle mooncakes last year. This year I am focusing more on that. There are also more variety of truffles available and I am indeed a happy girl. I also wanted to attempt the plain piglet as my sisters and kids love it. Wish me luck and have a Happy Weekend. I am submitting this to Dishes starting with O hosted by Alila's Kitchen. Cream butter and sugars together till creamy. Beat in the eggs and continue to beat till incorporated. Stir flour, oats, baking soda, salt, nutmeg and cinnamon together. Add raisins to the flour mixture. Next add the flour mixture to the creamed butter and mixed till well incorporated. Let the dough rest overnight in the fridge. Heat oven to 180 deg. Scoop dough with a large ice cream scoop and place them 3 cm apart. Flatten with either a spoon or your palm. Bake for 20 - 22 mins. Do not over bake to retain chewiness. Kids at that age will eat anything ! lol No wonder these cookies were gone in a flash as it really look scrumptious ! Hallo, I'm Francesca. I like your blog, it is very interesting. Visit also my space. Thank's. Francesca. Thanks for dropping by Francesca. Am hopping over to yours. hi Edith, wow, your boy can eat sweet stuff! Alice, my boy is a scary sweet tooth boy. He can whacked a huge packet of daim chocolate within a few hours. I have eaten a whole bottle of cookies myself and it is scary! I have never baked cookies myself. I will try your recipe. Phong Hong, my bottle is actually a cookie jar and it is big! So I am afriad for him. Edith, this is my type of cookies, looks so delicious.